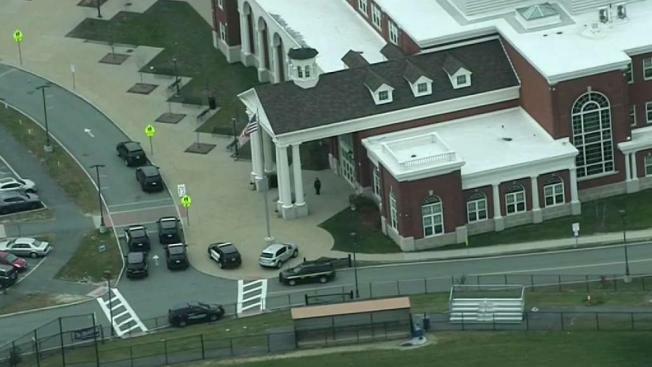 A school in East Bridgewater, Massachusetts was placed on lockdown Thursday morning following a threat made on a smartphone app. At approximately 7:15 a.m., police responded to East Bridgewater Junior/Senior High School after they were informed that a threat referencing the 1999 Columbine High School shooting was made toward the school. The threat was made on StopIt, an anonymous tip messaging application. School officials notified police and placed the campus under lockdown. Nearby schools also had students shelter-in-place out of caution. Police searched the school and determined that the threat was not credible. "We went through the entire school—not only all the lockers, buildings, hallways, classrooms—but we went through each of the classrooms with students, searched bags for the sole purpose to ensure the building was safe," said East Bridgewater Police Chief Scott Allen. Officials cleared the scene at 10:15 a.m. and said there was no threat to the campus. The school day resumed shortly thereafter. School officials and police are continuing to investigate. "The district takes all threats seriously and will take all precautionary and necessary measures to contain the possibility of a threat and to keep all students, staff, and personnel safe," School Superintendent Elizabeth Legault said.